How can we better protect our heritage? The Empress Hotel at 335 Yonge Street was destroyed yesterday in an early morning fire. Located on the southeast corner of Yonge Street and Gould Street, the Empress Hotel (1888) is a three-storey commercial building. The property was included on the City of Toronto's Inventory of Heritage Properties in 1974, and was designated last year under the Ontario Heritage Act in response to a demolition application. From the Intent to Designate Report: "The Empress Hotel has design value as a well-crafted example of a late 19th century commercial building that blends elements of the popular Second Empire and Romanesque Revival styles of the era. The distinctive corner tower with a classically detailed mansard roof from Second Empire styling is combined with the monumental round-arched openings that typify the Romanesque Revival style in a carefully crafted composition designed to enhance the presence of the building on Toronto's most prominent commercial street. 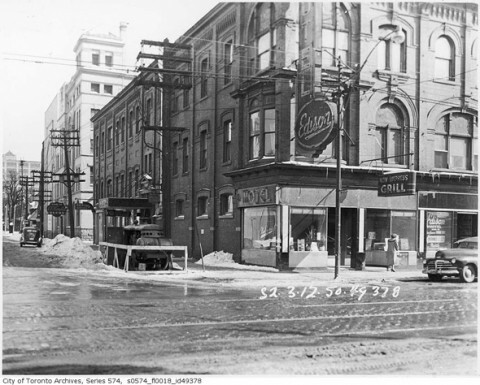 Toronto’s Queen Street, the portion running west from stately University to cosmopolitan Spadina, was originally a jumble of greasy spoons, barbershops and clothing stores. Owners lived above their shops, while children played on sidewalks. There were even a couple of watering holes that supplied the mostly Irish, Jewish and Eastern European locals with cold, cheap draft beer. By the late 1970s, those bars had become part of a fertile breeding ground, a creative hothouse of forceful protest, stylish adventure and uninhibited experimentation that produced an explosion of musical talent. In many ways, it paralleled the city’s fabled Yorkville scene of the previous decade, with a tight concentration of clubs that served as a launching pad for a generation of future stars.